Sometimes you just want a nice, thick, sandwich. You know, slather a little mustard, add a few tomatoes, maybe a pickle or two….mmmm. Maybe it’s just a guy thing. But what about the filling? Are there any good sandwich ‘meats’ that aren’t processed, full of fat, or guaranteed to leave some funky soy isolate taste in your mouth? The answer is most definitely yes! Vegan Tuna Salad! Ok, there’s not really any tuna in this…..we’re vegan remember? But it looks like tuna and spreads like tuna, so it’s the best description so far. And it’s made from a simple ingredient you can find in any grocery store. Yep. when you smash them down enough, it actually looks just like tuna. I use an old-fashioned potato masher. I guess you could use a food processor but for 1) you really don’t want a bean paste here (yuck) and 2) it’s just another gadget to clean, so I use a potato masher. And when they start slipping in between the wires of the smasher I switch over to a regular old fork. 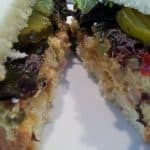 And when you add your typical tuna fish sandwich veggies, you know – onion, celery, pickle relish, etc – it looks pretty much like the real thing. Before you get started, add about 1/2 cup of raw cashews to your blender right now and a 1/2 cup of water. Just let these hang out awhile so they’ll get nice and soft. We’ll use these later for the dressing. I start with a single 15oz can of low sodium garbanzo beans. Rinse and drain them well and then plop them in a bowl big enough for you to work in. Now, go to town with that potato masher (or fork) just until the consistency is that of flaked tuna. It’s ok if you leave a bean or two untouched. Then I add about 1/2 cup of red onion, a single stalk of celery and a small carrot, all diced pretty fine. And finally, about 2 tablespoons of dill pickle relish. 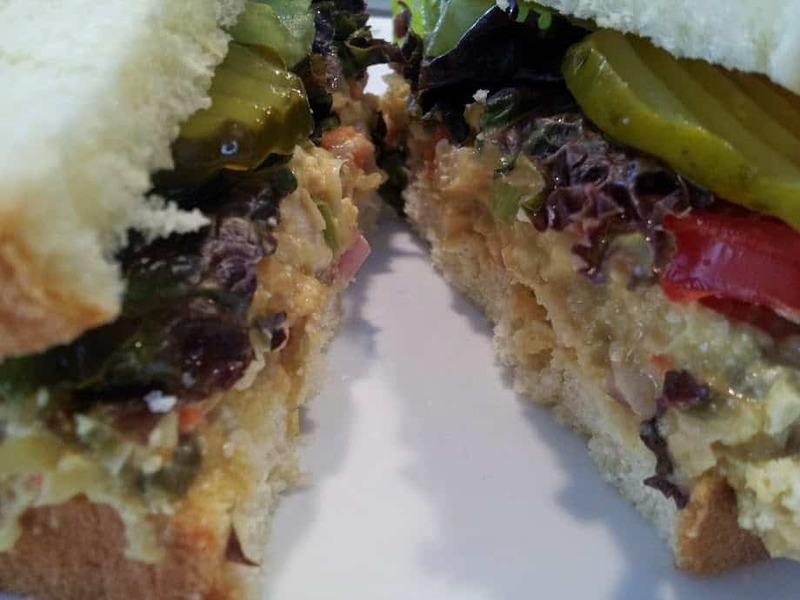 I always used relish in my tuna salad, but if you like sweet relish better – go for it. Stir that up a bit and it should look pretty good by now. Feel free to add whatever veggies you used in your tuna salad. Just make sure they are all chopped pretty small and about the same size. Now it’s time to make the dressing. At this point, we would ‘normally’ add gobs of full fat, artery clogging, mayonnaise. But to keep this recipe low-fat and healthy we’re going to use something else. Remember we had these guys soaking while we chopped the veggies? Well now add about 3 tablespoons of lemon juice, a couple of teaspoons of apple cider vinegar, 1 full tablespoons of regular yellow mustard, a teaspoon of low sodium soy sauce, and about 1/2 teaspoon of garlic powder. I also like nutritional yeast, so I add a teaspoon of that too. Now put the lid on and pulse your blender until the cashews get pulverized, and then run it on high-speed until you got a nice smooth dressing. You may want to stop every now and then to scrape down the sides. Pour the dressing into your ‘tuna’ and mix well. Vegan Tuna Salad, without the tuna! Garbanzo Beans, diced veggies, and a cashew based dressing come together in this healthier version of an American classic. Stir dressing into 'tuna' . This sounds great, can’t wait to try it. I really dislike the tofu-based homemade mayo subs so this would be perfect. I tried this tonight… yummy! I’ve tried recipes similar to this, but they were all too overpowering with the dressing. This was just right. Thanks! I do add dill relish but I also add sweet pickle relish as well as well as some chopped garlic. I like the fact that there is no mayo in this. I’ll have to try this with your additions Diane – thanks! Chuck…I actually just made a large batch of my faux tuna to take to a party tomorrow. I will give you the complete recipe in case you might want to make it sometime. I add a lot of seasonings but I believe this recipe takes any faux tuna recipe I have ever tried over the top or at least that is what I have been told by my family of SAD eaters and others. Hope you will secure the ingredients and give it a try. 1 can of low sodium garbanzo beans, rinsed, drained and smashed to the consistency of canned tuna. 4 or 5 chopped up wax peppers This is optional but it really makes a delicious addition that makes this recipe stand out. We pickle wax peppers ourselves so I use our peppers but Brunos pickles wax peppers commercially and they are found in most grocery stores. I used to also put our pickled wax peppers in real tuna when I ate it. The seasonings: I don’t measure….but I think it is the seasonings that really add to the flavor of this faux tuna. A few dashes of Herbmare Original Organic Herb Seasoning Salt found at TJ’s or in most grocery stores. I know our Ca Whole Foods carries it. Several dashes of Organic Kelp Granules (a low sodium salt alternative) also by Sea Seasonings. I have had to order these two seasonings online as Whole Foods no longer carries Dulse with Garlic but since I make a lot of faux tuna, I like having both on hand as they last a long time. And lastly….I use a homemade vegan mayo to taste. You can use your sauce but you may want to try it with a good homemade vegan mayo if you like a mayo in tuna which I do. Mix all well and allow to sit at least 2-4 hours or better if mix sits overnight. Let me know if you are able to secure the seasonings and if you make it. I am particular, like you seem to be, about the resulting flavors of the plant based foods I eat and I think this one is a winner. Hey Diane I am brand new to this web site and love the dishes he offers. I’m going to try his recipe and also yours. Do you have other recipes you share somewhere? Was i supposed to drain the cashews before adding the other ingredients? My “mayo” came out runny. Good question! I’m wondering the same thing. I think it’s supposed to be more of a “dressing” than a mayo, though, to be honest. So, it probably turned out like it was supposed to, but I’m looking forward to someone replying to you. I usually make my tuna salad just like this, but I also add mustard relish, because i used to always add mustard relish to my tuna. I love this more than real tuna now….and where I live, a can of chickpeas costs half of what a 6 oz can of tuna costs, and makes twice the amount. It’s awesome. This looks like a yummy recipe. The cashew sauce is a wonderful idea. Have you ever added wakame seaweed to it? It is a dried vegetable sold in Asian grocers that adds a sea/.umami flavor to foods. You soak a bit of it in water to reconstitute. It’s great in soups, and I like it in my faux tuna. Makes it more fishy. Adding kelp granuals adds a slight “fishy” flavor too. Made this for the first time today and all I can say is THANK YOU for this great recipe!! I couldn’t find my bottle of lite soy sauce after I had started the recipe so I substituted low sodium Worchester sauce instead, otherwise I made it exactly as written. I waited to add the dill pickle relish and I’m glad I did because I found the lemon juice added enough of a zip for me. I’ve always enjoyed tuna salad and this recipe has made me feel like I can still enjoy it. Thanks again for sharing. 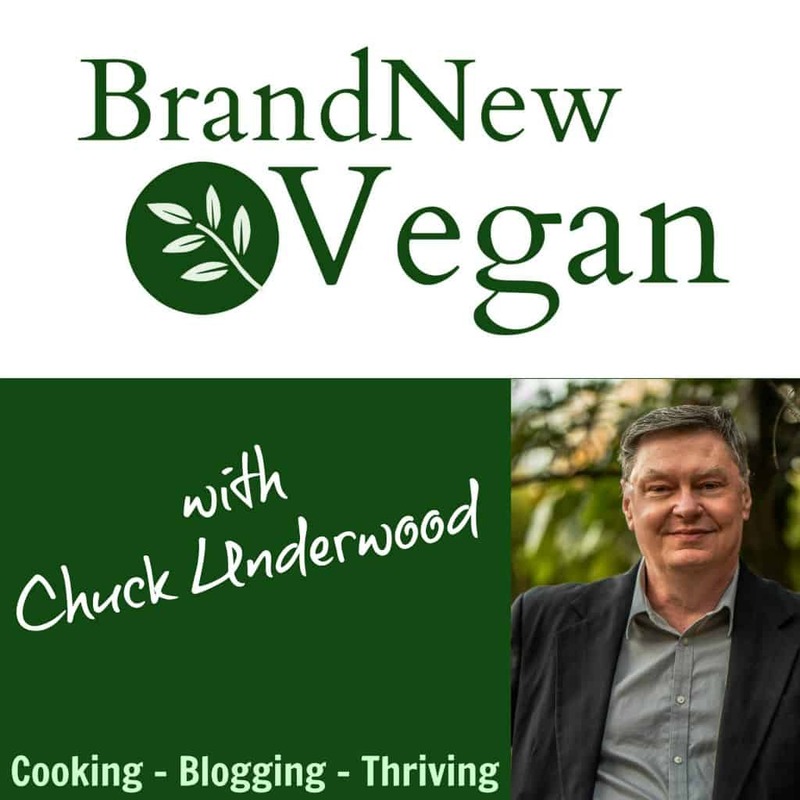 Would it work to use tofu instead of cashews? I’m looking for a way to make this on the road without a blender. Btw, this is soooooo yummy! Thank you! That’s how I make my mayo… with silken tofu… it’s awesome! I have tried several different “fake tuna” recipes. I am not kidding, this is THE BEST I have ever had! Not only did I love it but my 85 year old “Brand new vegan”!! father in law said he” could eat that anytime! 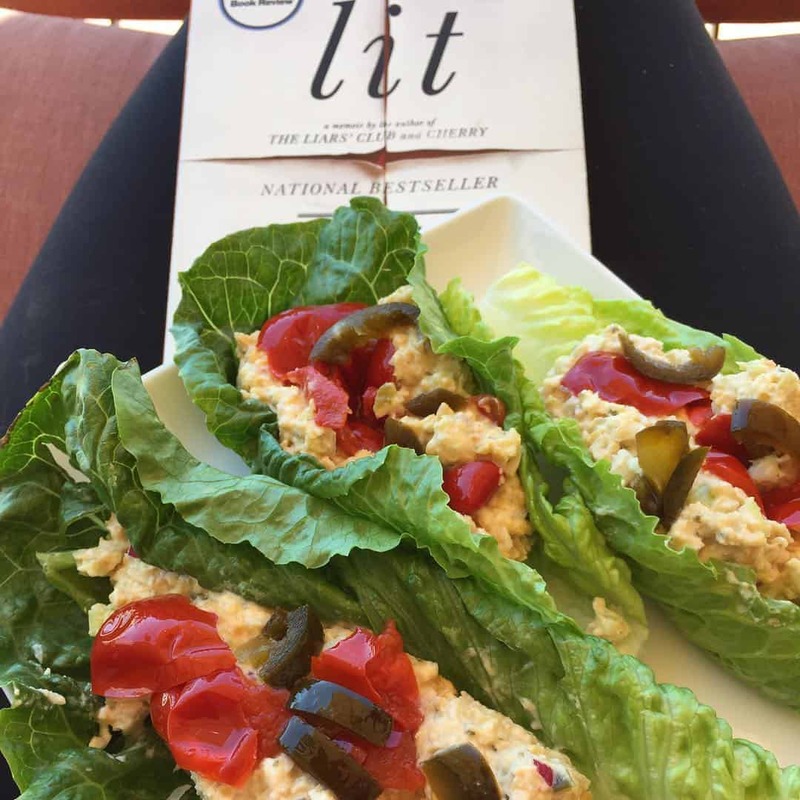 ” and thought the dressing would be great for dipping veggies in and over salads. So thank you so much for sharing this recipe. I’m getting ready to make a second batch! This recipe is the bomb! I made this with the potato wedges on your site as well. Delicious!! I love your recipes. I feel like I could get my adult non-vegan kids to try it and be, at least partially, convinced. I’m from NM so I love that you have traditional New Mexican food recipes!! I have REALLY missed it. You are doing a great service. Food makes us happy and good food makes us even happier! Maybe this has been asked, but how long will it keep in the fridge? I’m thinking way longer than regular Tuna Salad(even though I don’t eat actual Tuna)… It’s so awesome I could eat a ton of this, but not all of it at once… Also, has any one tried to freeze it. Made this last night along with the Crispy Fries, absolutely delicious!! I love all your recipes but ….. mine turned out so soupy! I read and re-read the recipe. I did everything you said to do . Could you give some tips as to why this happened? Is it supposed to be soupy at first and then it is better when cold? I did have to add some of my Penzeys spices for it to have a good flavor too.! Hi again Chuck . I left a review yesterday on your faux tuna recipe. I did not think it was that good. It was soupy and after a few hours in the fridge it did indeed go in the trash. However, when I posted my review I was asking questions about why it was soupy and the flavor not really good. Constructive criticism . I noticed today that you did not post my review. Do you only post reviews from people who love your recipes and not from those who did not think they were that great? When I want to make a recipe I like to read comments from both sides…those who love it and from those who find the recipe did not turn out that great. I have been following you for a long time and enjoy the majority of your recipes. I just dont think it is fair that you post only comments from people who adore your recipes . So, if it’s your first comment on the blog, I have to physically approve it. Sorry, I didn’t approve it until now, but it IS my weekend and I was very busy yesterday. I had a long list of things to do, and focusing on the blog wasn’t one of them. And yes, I DO get ‘not so nice’ reviews occasionally, and yes I DO post them (if they are constructive). But some are just downright ugly and nasty and sure, I’ll delete those. One person said my recipes was BAD, when I have lots of other people who have made the exact same recipe and loved it. Was it really bad then? No, she just didn’t like it – but that doesn’t mean it’s a bad recipe. We all have different tastes. Why was yours so soupy? I really have no idea as I wasn’t there to see what ingredients you used or how you put it together. Again, lots of other people have made this without any problems and they love it, so I really can’t tell you what went wrong. That’s why I’m making videos now, so people can watch me make the recipes and follow along. Thank you for responding Chuck! After reading my second comment I realized it sounded very “ snarky”!!! Please forgive me. I think you are an awesome vegan chef and you put lots of time , energy and love into your recipes for all of us. Yes.. maybe this one didn’t turn out for me but sooo many of your recipes are very delicious. Feel free to remove both of my comments. Again I apologize for my comment! 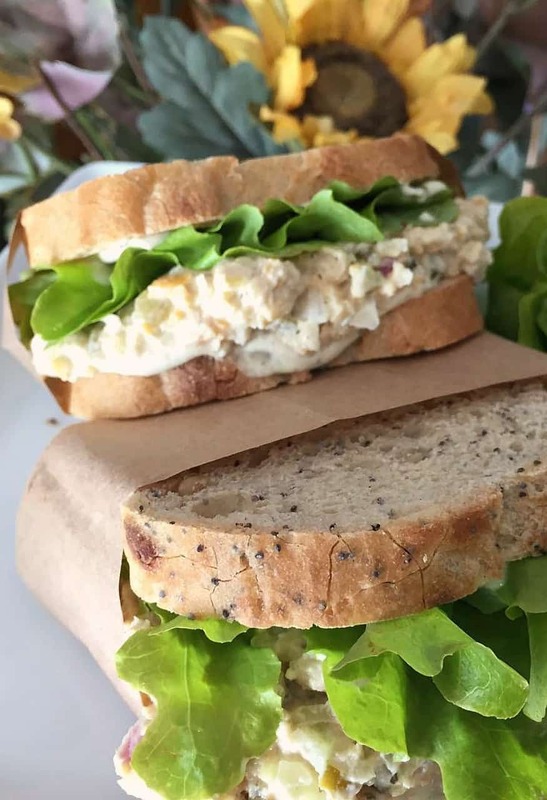 I grew up on tuna salad sandwiches and this is by far the best vegan version I’ve had yet! Tastes closest to the real thing (minus the fishy taste of course). I even love the cashew dressing as opposed to using mayo. Tastes a lot lighter but still super creamy. Definitely a new staple for me! Loved this recipe!. Love how much it looks like the real tuna salad. So easy to surprise friends and family. Thanks! How long do you soak the cashews? Do I drain them before adding the other ingredients to the blender? Thanks. The longer the better for creaminess. You can also boil them for 10-15 minutes too and yes, then completely drain them before using.